The loyalty program awards points for purchases. 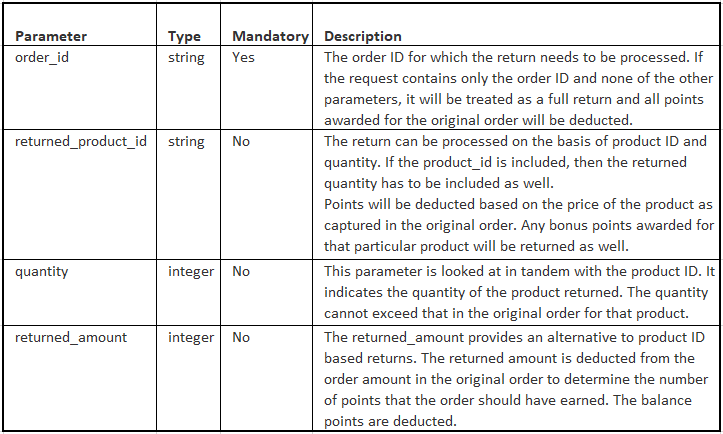 When an order is returned, the points should be deducted from the user's account. The Returns Tracking API passes the data for each return to Zinrelo. These returns are correlated against an earlier corresponding purchase. This Returns Tracking API enables Zinrelo to deduct points for returned purchases. This API is typically called from the server side when the return transaction is created. Click here for detailed documentation regarding this API. Shown below is a sample Python script to call the Zinrelo Returns API. 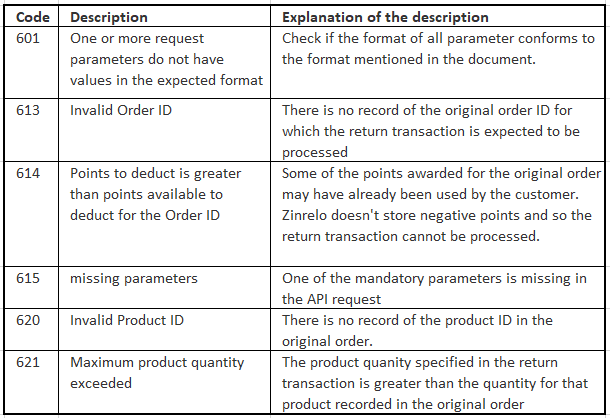 Here is a description of the query parameters used in the payload of the Returns API call. Zinrelo will respond with standard HTTP success or failure codes. In case of a success response, the return transaction will reflect in the customer's account in the Zinrelo admin console. For failures, Zinrelo will also include extra information about what went wrong, encoded in the response as JSON. The various HTTP and API status codes that Zinrelo returns are listed below. The error handling code should log the error response. If you need to look into why a return transaction was not processed, the logs will provide that information easily.